What a difference just one pot plant can make! One of my favourite quotes is this one from Timothy Beatley, a leader in the greening of cities movement, “Few elixirs have the power and punch to heal, restore, and rejuvenate the way that nature can”. I was reminded of this quote recently when I came across a report of an experimental investigation of the effects of indoor plants on office workers’ well-being. 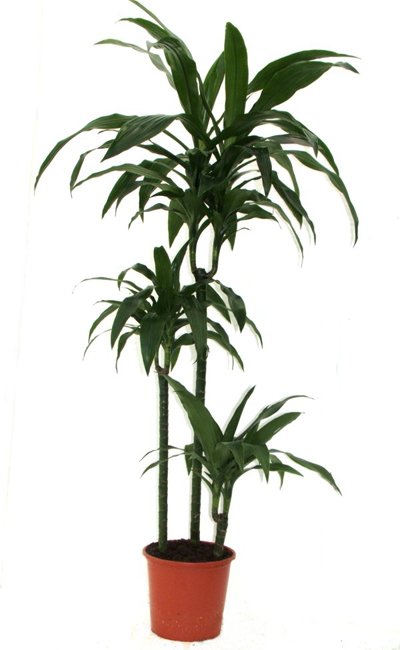 Staff who had plants (like the Dracaena in the photo) placed in their offices showed reductions in stress levels, negative feelings and fatigue in the order of 30 to 60%, while those with no plants recorded increases in stress and negativity of 20 to 40%, over the three-month test period. The effects of different numbers of plants were compared and most interestingly, just one office plant was enough to make the difference. These results line up with those from a number of other studies, several of which also show that the presence of pot plants in offices leads to greater productivity and work satisfaction. The power of greenery to reduce stress is well established so it is not surprising that pot plants do this for office workers. But the fact that the presence of indoor plants also lifts mood and reduces fatigue may not be as widely appreciated. Rachel and Stephen Kaplan have spent 30 years studying the link between nature and recovery from fatigue. They have shown that greenery is particularly effective in reducing the fatigue that follows periods of concentrated attention. Working at a computer, driving a vehicle and even negotiating a busy shopping centre are all situations that produce concentrated attention fatigue. You are probably familiar with the symptoms – tiredness, loss of concentration and irritability. The Kaplans argue that nature restores tired eyes and brains by allowing us to switch from “unnatural”, directed or focussed attention to the “natural” and non-demanding attention we use when we are looking at natural greenery. We do not force ourselves to pay attention to nature. We do that effortlessly because that is what our senses and our brain have evolved to do. The differences between the two forms of attention lie at the core of what the Kaplans call their Attention Restoration Theory (ART). The theory is supported by evidence for countless studies. That is why I place restoration, along with the beauty buzz and relaxation (stress reduction), among the “gifts” of biophilia.